Yule, or the Winter Solstice, is traditionally celebrated around the 21st or 22nd of December. The wheel of the year brings us to Yule and the God (who died at Samhain) is reborn. Winter Solstice marks a point of dramatic natural change at most places on Earth. One of the most common themes that is played out during this part of the year is the Celtic battle between the aging Holly King (who represents the darkness of the old year) and the young Oak King (who symbolizes the light of the new year). Winter Solstice marks the longest night and the shortest day of the year. From now until Litha, the days will begin to grow longer as we welcome back the returning Sun. On Yule, we honor the Goddess, Mother Earth, for giving birth once more to the Sun. People around the world celebrate this time of year with varying traditional festivals such as Christmas, Hanukkah, Kwanzaa and Yule. For this reason, Yule is one of the most widely celebrated of all of the sabbats. The customs and lore have deeply invaded popular cultures and mainstream religions and virtually every culture in the Northern Hemisphere acknowledges this time of year as special in one way or another. It is widely believed that many of the traditional symbols marking this part of the year are actually taken from ancient pagan traditions. For example, the traditional Christmas tree is believed to originate all the way back to the Greeks and Romans of the 8th century. Santa Clause, or Kris Kringle, may actually have his origins in the Aryan God Odin, Lord of the Winds. Wassail comes to us from the Anglo-Saxons and means to hail or salute. Trees were sprinkled with a mixture of eggs, apples, wine, and ale and this was believed to increase fertility and good fortune for the coming year. Many gods and goddesses were celebrated and hailed during this time of year. Among the gods were Apollo, Balder, Father Sun, Father Winter, Jesus, Saturn, Mithra, Oak King, Odin, Ra, Thor, Woden, and Zeus. Among the goddesses were Demeter, Frigg, Freya, Isis, Mary, Sophia, Mother Night, and Lucina. This year, we have chosen to celebrate Frigg and Baldur. Frigg was a Norse Goddess who had the power of prophesy but she did not always reveal all that she knew. Her name means “love” or “beloved one.” She was the goddess associated with the end of the year, as she sat at her spindle and wove the destiny of both the gods and man. Frigg was also the mother of Baldur, whose father was Odin. Frigg saw the destiny of her son as well as his coming death. She set about to change his destiny and she extracted a promise from all living things that they would play no part in his death. However, she overlooked the Mistletoe plant, which she believed was insignificant. Loki, the Trickster, saw her error, and he made a dart from this poisonous plant, which eventually found it’s way into Baldur’s heart. Hermod, Baldur’s brother and messenger of the Norse gods, felt the pain of his mother over the passing of Baldur and travelled to the underworld to appeal to Hel. She told him that she would only release his brother if all things in the world, living and dead, wept for him as well. All things took pity on her and wept, except for Loki who refused to mourn. Therefore, Frigg and Hermod were ultimately unable to rescue Baldur. However, Frigg is worshiped as a great mother who tried to save her son and she protects all women who are pregnant and giving birth. Tonight, we honor both Frigg and her son Baldur. Webster’s Dictionary defines Yule as: the feast of the nativity of Jesus Christ. Many other dictionary sources cite similar definitions. So, at first glance, Yule doesn’t seem like it would be a holiday for Pagans to celebrate. After all, think of all the Christmas carols that speak of celebrating yuletide, and bringing Yule cheer! However, Yule wasn’t always associated with Christmas, and the birth of Christ. Prior to the birth of Christ and the development of the Christian religion, many native people celebrated a winter holiday that occurred on or near the winter solstice. The winter solstice happens on or around December 21 (20-22) each year. The winter solstice marks the longest night of the year. Most ancient European people celebrated this holiday with festivals, each similar to one another, but very different. The most well-known Pagan winter festival is the festival of Saturnalia- the birthday of the Unconquered Sun. The Romans celebrated this festival with friends and family in homes decked with laurel and holly. Evergreen boughs were brought into the home and decorated temples as a sign of the cycle of life. No criminals were executed during this time, and schools were closed, and the people rested. Good luck gifts were exchanged with friends and family, and the season was a time of goodwill. Parades and processions through the street were very common during Saturnalia. In the area of Scandinavia, it would be dark for days during the winter months. During this darkness, scouts would be sent to the mountain tops to watch for any sign of the rising sun. Many people would light candles in their windows to help encourage the sun to return. Once the sun returned, the scouts would return to the villages with the good news. A great festival would be held. This festival would be called Yuletide and people would celebrate with bonfires and feast around the Yule log. The people in the Mesopotamian area celebrated a new year’s festival around the Winter Solstice called Zagmuk. The people of Mesopotamia believed in many gods, but above all, they wor- shipped a chief god, Marduk. They believed that Marduk would do battle with the demons of chaos. During Zagmuk, the people planned to assist Marduk. According to tradition, during this 12 day festival, the King is sup- posed to die as a sacrifice, and return to fight alongside Marduk. However, instead of the king actually dying, the people would dress up a criminal and treat him as royalty for a day. Then, the criminal was slain, sparing the king, but yet aiding Marduk in his fight. The Persians and the Babylonians celebrated their festival of Sacaea. Their festival was very similar to Zagmuk. One interesting highlight of Sacaea is that during the festival, masters and slaves would change places. Also celebrating a similar holiday were the Greeks, who made sacrifices to aid the God Kronos, who would be gearing up for battle against Zeus and his Titans. For many years, Christmas was celebrated on various dates from December to April. In 350 CE, Pope Julius I decreed that the official date of Christ’s birth was December 25. Many scholars disagree, but since 350 CE, Christmas has been celebrated on that date. Even though most people no longer practice the ancient Pagan festivals, the winter traditions of olde are still evident and practiced each holiday season. Next time you see a Christmas tree, a pile of presents, or lit candles in a window, know that these traditions transcend centuries of celebrations. Here's a quick and easy list of ritual circle/ gathering etiquette. This may help those new to the craft, or new to group ritual situations. Blessed be! Cut a door in the circle yourself- speak with one of your hosts if you need to leave the circle. You most likely won’t be readmitted. Last night we held our eighth annual Friends and Family Yule Circle, here in La Mirada. We invited new friends and old, and honored Frigga and Baldur under sprinkles that ended up being a light rain. Our ritual included charging a yule log filled with our wishes for the new year. Large holes were drilled in a thick log, and we placed paper inside the holes. Following the circle, we placed the log in one of our fire pits. After everyone left, the sisters of the coven kept vigil until the early hours, ensuring it burned completely. 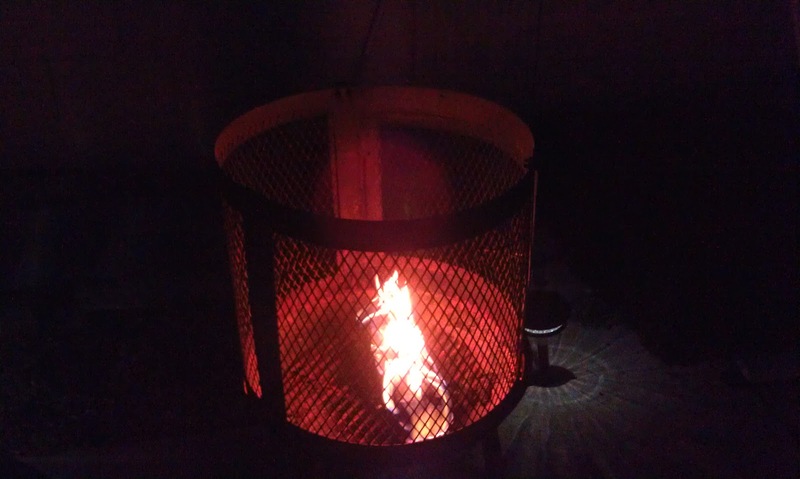 In addition to raising charged energy for our yule log, we also did an adaptation of a blot- a toasting circle. We've never tried anything like this before, our rituals tend to be pretty serious and quiet, but we had a great time. It was raining on us, however, so we decided to cut the meditation out- as it would have been difficult to concentrate, and there was no sitting on the ground to be had. Because we cut the meditation out, I'm posting it below, as our sister Rayne wrote the beautiful piece, and it's not fair that it would go unread. After ritual, the altar was removed, and a conversation fire pit was brought out. Of course, as soon as ritual was over, the weather was much better, and our fires were toasty and warm. Though it rained, our candles didn't go out! All in all, 23 people attended our event, and we had around 16 people in our circle (if I counted correctly) - I believe that's our largest circle yet. We'll most likely be holding our next open circle in the Summer. If/when I see pictures of our gathering, I'll post them. Thanks to our friends and family who attended... Blessed be! Sit or stand comfortably. Start by taking a deep breath to the count of 4....Hold it in a few seconds and release it slowly....As you release your breath focus on all of your muscles relaxing. Starting from your head...to your shoulders...your arms and middle...your legs....all the way to your toes.....With each breath relax a little more...Feel all the stress and worry from your day float away....just relax. As your third eye comes to focus you find yourself on a snow covered path...The snow that has fallen is fresh and it looks like nobody has traveled this path since the snow started. Take a moment to feel the air around you...cold and damp...You bring your cloak closer around you as you start walking down the path....As you walk you notice an object hanging from one of the tree limbs...As you get closer you notice a pretty yellow stone on a ribbon. You wonder for a second why it is there and why it isn’t covered in snow. This thought passes quickly as you reach up and grab it and put it in your pocket. Continue down the path...It starts to slope slightly down hill....At the end of the slope you come to an opening where there are no trees. You can clearly see the sky. As you look around you notice a woman sitting in the middle of the clearing. As you move closer you notice the woman looks kind and motherly. You approach her and ask her name. She says “You know me child, I am Frigga. I’m here to help you see what’s to come.” You take a seat in front of her. Somehow you hadn’t noticed the smoothed stump there before. Listen as the Goddess tells you the things you need to know for the coming year. ........When she is finished you remember the stone that you put in your pocket earlier and offer it to her...Frigga smiles and thanks you for your offering. I don’t know about you, but it feels as though this year has been one of loss and heartache, at least for my family and friends. We’ve had loved ones pass away, both sudden and expected, but it’s never, ever easy. Others have been diagnosed with scary illnesses that may endanger their lives. I can only imagine how tough it must be for them to keep their spirits high. Many of my friends have also faced financial loss- of jobs, and homes, and other issues of security. I was reading on the myth of Frigga and Baldur, as those are the deities we plan to honor at the coven’s annual open Yule rite, and one lesson jumped out at me. Sometimes, no matter how hard we try, what we want is not in the cards; it’s out of our hands. Baldur is the son of Frigga, a Norse goddess associated with motherhood and the sky. They lived in Asgard, and Frigga and her husband Odin ruled over the Aesir, the principle race of the Norse Gods. Frigga began having awful nightmares about her son, Baldur, dying before his time at the hand of his blind brother, Hod. After conferring with Baldur, it was known that he had been having very similar dreams. Odin invoked the prophetess Wala, and she also confirmed that Baldur was destined for the Otherworld before his time. Frigga, panicked, took the names of every living thing and set about visiting them to gain their oath that they would not harm Baldur in any way. Having received the oaths, they threw a lovely banquet in celebration. The other gods threw objects at Baldur, as it was entertaining to watch them hit the god, but Baldur remained unharmed. Loki, the trickster, dressed as an old woman and cornered Frigga at the party, asking her questions about the oaths taken to do no harm to Baldur. He asked many questions until Frigga told him quietly, that the only oath she did not receive was that from the mistletoe, as she felt that it was too small and innocent and was unable to do harm to her son. Loki took that information and fashioned an arrow out of mistletoe. He then asked Baldur’s brother Hod why he wasn’t participating. When Hod replied it was because he was blind and couldn’t shoot arrows like the others in fear of harming anyone, Loki offered to help. Hod took the arrow from Loki and notched it in his bow. Loki helped Hod aim the arrow and shot it at Baldur. His aim was true, and Baldur died, fulfilling Wala’s prophecy. Aldur’s wife, Nanna died shortly thereafter, of a broken heart. At the funeral, Frigga and Odin sent Baldur and Nanna to the Otherworld in a burning boat. Receiving the boat was Hel, the Goddess of the dead. Never had Asgard grieved so much. Frigga was inconsolable. Hermodur, the divine messenger was so touched by Frigga’s grief that he went to try to persuade Hel to let Baldur return. He rode for nine days on Odin’s eight-legged horse until he reached the realm of Hel. Hel didn’t want to give up Baldur, as it was well known that once one enters Her realm, that they will never return to the realm of the living. Finally, Hel broke down and agreed to release Baldur and Nanna, but only if every living creature upon the earth would cry tears for Baldur. Driven by hope, Hermodur raced to Asgard to give Odin and Frigga the news. Frigga implored every creature to cry tears for her beloved Baldur, so that he might return once again to Asgard. Every creature cried. Every creature, but one. Loki had transformed himself into a giantess, Thokk, who refused to cry for Baldur, and so Baldur still sits in the realm of the goddess Hel, and will remain there, until the end of the world, Ragnarok. No matter how hard Frigga tried, and no matter how many tears fell for Baldur, he remains with his wife in the Otherworld. He’s not hurting, he’s not in pain, he’s waiting to be reborn in the new world. Like Frigga, we cope with the possibility of loss by trying to circumvent it, in any way we can. With treatments, and love, in energy and in prayers, we try to control the situation. This is natural and good, and within our means to do so. Sometimes it works out in our favor, and sometimes it doesn’t. Still, I can’t help but feel as though we get some sort of cosmic “credit” for trying. That the energy we put toward the health of our loved ones, financial stability or happiness is thrown out unto the universe. Not only may the universe apply it where we hope, but also, that this energy, with our pure and good intent might come back to us in some way, guided by the law of return. Perhaps this might be in the smile of a child, a message from a loved one, or in the warm, loving energy of family at the holidays. It’s important that we acknowledge our loss, but it’s also important that we do not allow our losses to cloud our lives permanently. Depression and sadness is part of loss, it’s part of the grieving process, and it’s crucial that we allows ourselves this time to go through the cycle. However, we shouldn’t allow our loss to completely take away our ability to see good in our lives. The gods will things beyond our control- and we aren’t always going to understand it. It's not easy to move past it, it seems like a new lesson every time. But we should do our best to live our lives the best we can, finding our joy wherever possible. Open your heart; do not shut it completely, waiting for another loss to come. There will always be loss, such is the nature of life. But there will also always be love, always be sunshine. Don’t let the possibility of shadows chase away your sunshine. Live in the moment, love your family, appreciate what you have today- and embrace your sunshine. During our December meeting, we cemented in our plans for our Friends and Family Yule this weekend, and instead of our all-coven meeting, we attended the Solstice Party for the SoCalSisterWitches yahoogroup. It seems as though we have lots of RSVPs for this weekends ritual. We also discussed our chosen patroness for next year, as well as our goals and ideas for next year. Soon, the new year will be upon us, full of change and growth!